BYD, the Chinese car startup backed by billionaire Warren Buffett, recently introduced a new all-electric model at the 2018 Guangzhou Auto Show dubbed the Tang EV 600, reports InsideEVs. It looks quite decent, it’ll reportedly have a 373 mile range on a single charge. Its dual-motor all-wheel-drive powertrain (360 kW total) enables acceleration from 0 to 100 km/h (62 mph) in 4.4 seconds. Chinese manufacturer envisioned also 30-minute fast recharge. The pure electric Tang will be available in five and seven-seat (2+3+2) versions. 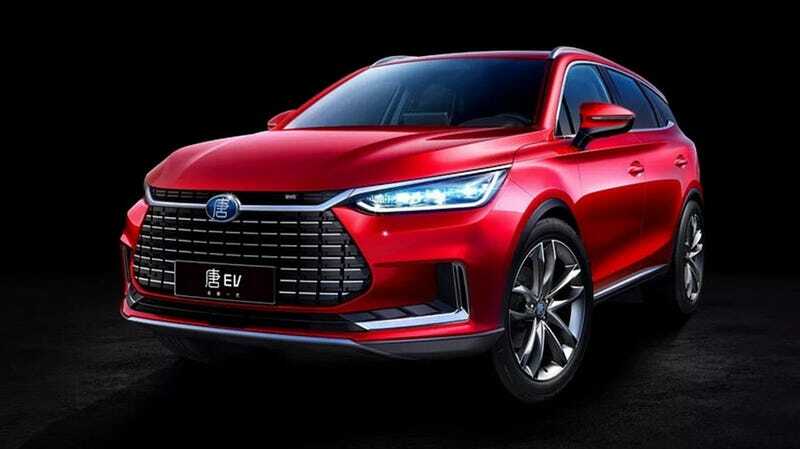 BYD also apparently thinks it can provide fast-charging capabilities that replenishes the Tang EV 600 in around 30 minutes, InsideEVs says, and the SUV’s expected to be priced between $37,400-$51,800. It’s unclear just yet where the Tang EV600 will be offered, but if those specs pan out, the market for 300-mile+ range EVs just got a little more crowded.